The King's Speech is a historical drama based on the monarchy of King George VI. It was released in 2010. Colin Firth plays King George VI, who must step up to assume the throne when his brother abdicates from ruling. He is seen as unfit to rule due to a serious speech issue that causes him to heavily stutter whenever he speaks. In order to overcome this, he engages in assistance with trying to conquer his speech impediment with Lionel Logue, an Australian speech therapist, played by Geoffrey Rush. This movie is very focused on the personal life and struggles of King George VI, as opposed to the political front. Throughout the movie, George works with his therapist to try and improve on his speaking skills. Due to his inability to speak without stuttering, he is often under scrutiny about whether or not he is a fit ruler. Lionel works with the King to find unique and unorthodox ways to help him improve his ability to speak clearly. As the movie progresses, you begin to see how complex the King's life is behind the closed doors of being a leader. He fights to convince his country he is a fitting ruler, while struggling with the many complications in his personal life, including family issues and conquering his own fear of failing his people whilst a war is occurring. While the film mostly focuses on the private struggles of the King, there is also a very heavy historical presence of the events taking place for England during this time. This film progresses through the beginning of World War II, and the terrifying prospects of war in England during that time period. Many of the personal struggles that King George VI faces are echoed in the decisions being made in relation to the war. This film shows excellent detail to historical fact, as well as an in-depth view to the interconnections and relationships among the Royal family and politicians during this time period. While the film focuses mostly on the King, there is very specific detail to the relationships between secondary characters as well. There is thorough attention to the relationship between England and the rest of Europe during early World War II as well. This movie is full of informative facts and strong personal struggles on the part of the country and King alike. 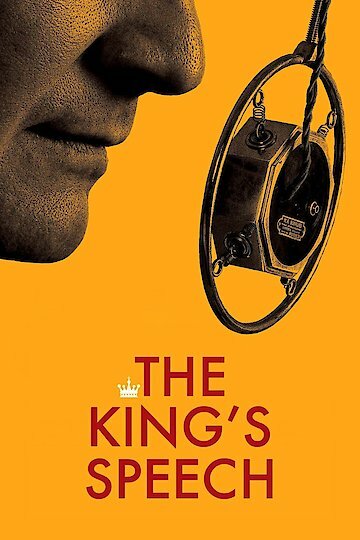 The King's Speech is currently available to watch and stream, download, buy on demand at Netflix, Amazon, Vudu, Google Play, FandangoNow, YouTube VOD online.